On 10/9, there was a seiyuu audition which was open to the public, for some new game. 20 young seiyuu participated, and the crowd was able to cast a vote. 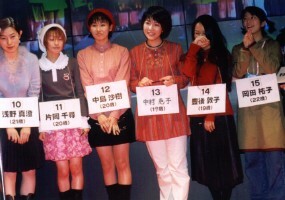 The seiyuu were all lined up on the not-so-big stage, wearing a large sign with their name on it. Since the whole "audition" only lasted about one hour, there wasn't that much time for each seiyuu. At first, they all introduced themselves. Then they all shouted into a noise meter to see how loud they were. They all seemed to hover around 110 to 120 decibels. Then they all had to say one tongue twister. Some of the girls had trouble, but most of them were able to say it within three tries. I cast my vote for #12, Nakajima Saki (20 years old).